Font Size Toggle Select Vector image of a downward-pointing triangle. Contrast Toggle Select Vector image of a downward-pointing triangle. Fort Wayne Philharmonic A vector image of the Fort Wayne Philharmonic logo. Search A vector image of a magnifying glass. Events Chevron A vector image of a chevron. Experience Chevron A vector image of a chevron. Education Chevron A vector image of a chevron. Get Involved Chevron A vector image of a chevron. About Chevron A vector image of a chevron. Caleb Young joined the Fort Wayne Philharmonic as Assistant Conductor in the fall of 2016. 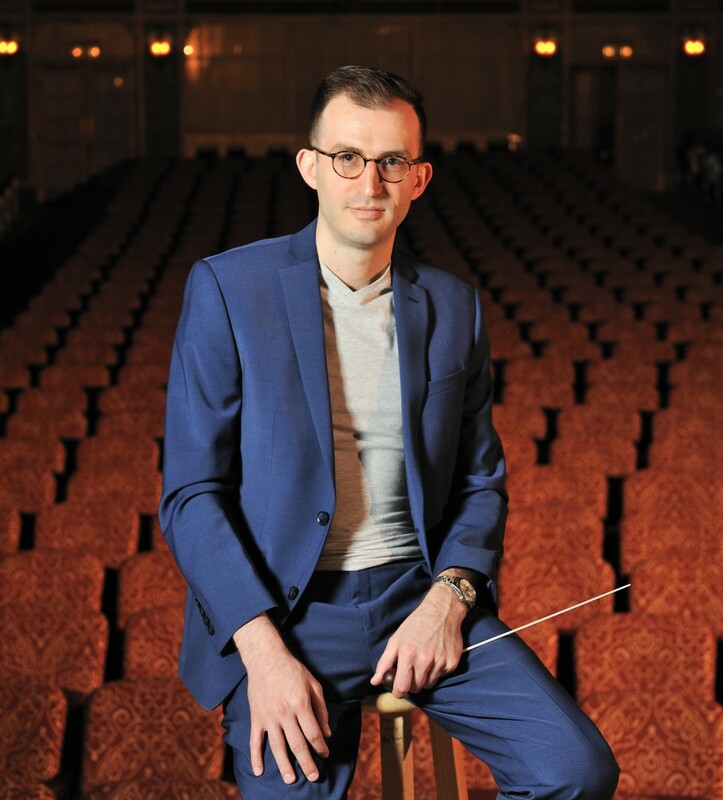 For the 75th Anniversary Season Young has been promoted to Associate Conductor. He serves as cover conductor to all Masterworks and other selected programs and conducts various concerts throughout the season including pops, education, family, ballet, film and other specials. Young is dedicated to attracting younger audiences to the Philharmonic, pioneering the “Music and Mixology” series. Young has conducted the Oregon Symphony, Fort Worth Symphony Orchestra, Columbus Symphony Orchestra, Toledo Symphony Orchestra, Russian National Orchestra, and the Asheville Ballet. He has assisted and covered such organizations as the Cincinnati Symphony, St. Louis Symphony, Van Cliburn Competition, Atlanta Opera, Portland Symphony and the National Music Festival. In 2016 Young was selected by members of the Vienna Philharmonic for the American Austrian Foundation’s (AAF) Ansbacher Conducting Fellowship Prize, which takes place during the prestigious Salzburg Festival. Young was also selected as a participant conductor in the Cabrillo Festival of Contemporary Music, where he performed and worked with Marin Alsop and James Ross. Young has also served as assistant conductor for the National Music Festival. Young serves as founder and conductor of KammerMahler, a mobile chamber orchestra, founded in 2013, which specializes in performing large scale symphonic works in a chamber orchestra setting. Among its many accomplishments, KammerMahler recorded and released the world premier album of Klaus Simon’s arrangement of Mahler’s Symphony No. 9. During the 2012-13 season Young served as the Music Director of the Indiana Youth Musicians, where he conducted the youth orchestra and coached chamber music. A native of Asheville, North Carolina, Young started his musical training on piano at the age of three. He received his master’s degree in orchestral conducting from Indiana University’s Jacobs School of Music, where he studied with David Effron and Arthur Fagen. Other teachers include Demondrae Thurman and John Ratledge. Join our mailing list to get the latest news and updates from the Fort Wayne Phil. Envelope A vector image of an envelope.